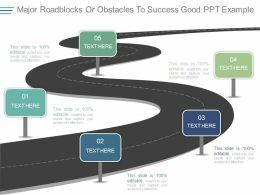 Presenting major roadblocks or obstacles to success ppt slide styles. 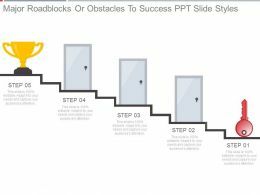 This is a major roadblocks or obstacles to success ppt slide styles. This is a five stage process. The stages in this process are security, business, marketing, success, process. 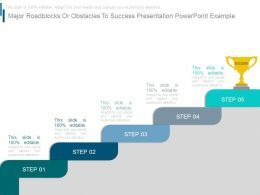 Presenting roadblocks or obstacles to success presentation powerpoint example. 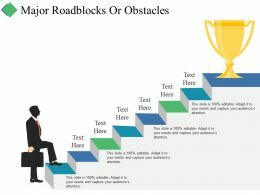 This is a roadblocks or obstacles to success presentation powerpoint example. This is five stage process. The stages in this process are process, management, trophy, business, success. 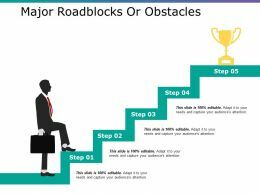 Presenting major roadblocks or obstacles to success good ppt example. 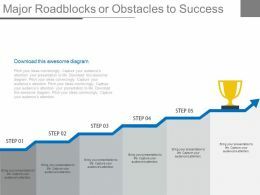 This is a major roadblocks or obstacles to success good ppt example. This is a five stage process. The stages in this process are business, strategy, management, development, planning. 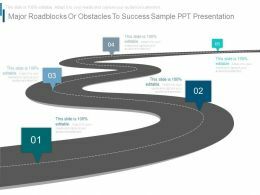 Presenting major roadblocks or obstacles to success sample ppt presentation. 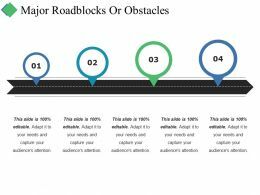 This is a major roadblocks or obstacles to success sample ppt presentation. This is five stage process. The stages in this process are roadmap, planning, strategy, management, business, success. 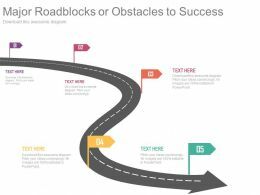 Presenting major roadblocks or obstacles to success ppt slide templates. 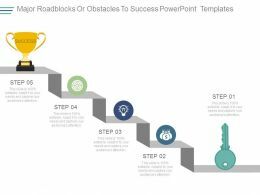 This is a major roadblocks or obstacles to success ppt slide templates. This is a five stage process. The stages in this process are arrow, business, planning, strategy, timeline, management. 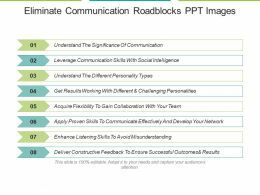 Presenting eliminate communication roadblocks ppt images. This is a eliminate communication roadblocks ppt images. This is a eight stage process. The stages in this process are business, management, strategy, communication, success. 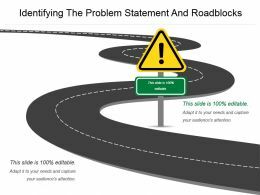 Presenting major roadblocks or obstacles to success ppt slides. 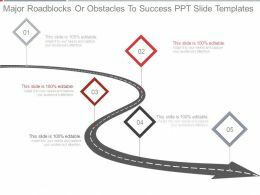 This is a major roadblocks or obstacles to success ppt slides. This is a five stage process. The stages in this process are roadmap, planning, arrows, strategy, business. 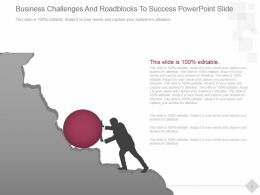 Presenting major roadblocks or obstacles to success powerpoint templates. 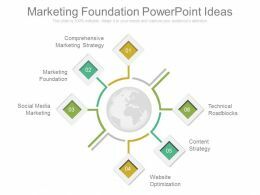 This is a major roadblocks or obstacles to success powerpoint templates. This is a five stage process. The stages in this process are business, strategy, management, development, success, step. Presenting this set of slides with name - Roadblocks Covering Barrier With Traffic Controller Icon. This is a one stage process. The stages in this process are Roadblocks Icon, Barrier Icon, Barricade Icon. 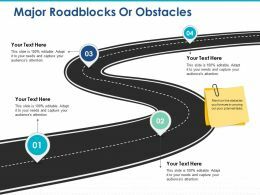 Presenting this set of slides with name - Major Roadblocks Or Obstacles Ppt Infographic Template. This is a four stage process. The stages in this process are Business, Marketing, Strategy, Planning, Our Goals. 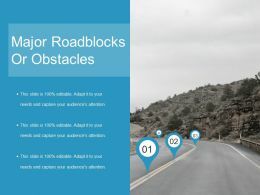 Presenting this set of slides with name - Major Roadblocks Or Obstacles Ppt Outline Background Image. This is a four stage process. The stages in this process are Year, Growth, Success, Time Planning, Business. Presenting this set of slides with name - Roadblocks Covering Barrier With Lines Icon. This is a one stage process. The stages in this process are Roadblocks Icon, Barrier Icon, Barricade Icon. Presenting this set of slides with name - Major Roadblocks Or Obstacles Ppt Layout. This is a four stage process. The stages in this process are Roadmap, Obstacles, Business, Planning, Management. Presenting this set of slides with name - Major Roadblocks Or Obstacles Ppt Icon. This is a four stage process. The stages in this process are Business, Target, Success, Planning, Management, Growth. 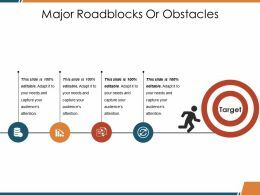 Presenting this set of slides with name - Major Roadblocks Or Obstacles Powerpoint Slide Show. This is a four stage process. The stages in this process are Business, Marketing, Strategy, Planning, Process. Presenting this set of slides with name - Major Roadblocks Or Obstacles Ppt Visual Aids Summary. This is a four stage process. The stages in this process are Target, Our Goal, Business, Marketing, Competition. 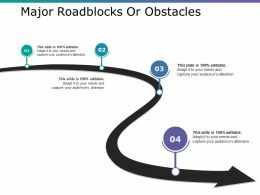 Presenting this set of slides with name - Major Roadblocks Or Obstacles Ppt Summary Templates. This is a four stage process. The stages in this process are Obstacles, Business, Management, Marketing, Planning . 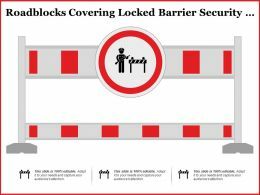 Presenting this set of slides with name - Roadblocks Covering Barrier Away With Safety Signs. This is a one stage process. The stages in this process are Roadblocks Icon, Barrier Icon, Barricade Icon. 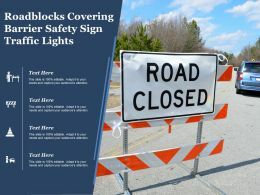 Presenting this set of slides with name - Roadblocks Covering Barrier Safety Sign Traffic Lights. This is a one stage process. The stages in this process are Roadblocks Icon, Barrier Icon, Barricade Icon. 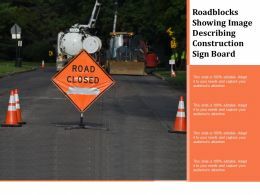 Presenting this set of slides with name - Roadblocks Showing Image Describing Construction Sign Board. This is a one stage process. The stages in this process are Roadblocks Icon, Barrier Icon, Barricade Icon. Presenting this set of slides with name - Roadblocks Covering Barrier Sign Board Icon. This is a one stage process. The stages in this process are Roadblocks Icon, Barrier Icon, Barricade Icon. Presenting this set of slides with name - Roadblocks Covering Barrier With Four Legs Icon. This is a one stage process. The stages in this process are Roadblocks Icon, Barrier Icon, Barricade Icon. Presenting this set of slides with name - Major Roadblocks Or Obstacles Ppt Images. This is a four stage process. The stages in this process are Obstacles, Portfolio, Business, Marketing, Planning. 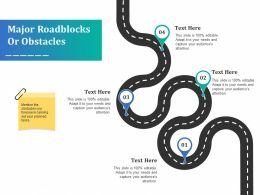 Presenting this set of slides with name - Major Roadblocks Or Obstacles Ppt Layouts Clipart. This is a five stage process. The stages in this process are Silhouette, People, Communication, Business, Marketing. 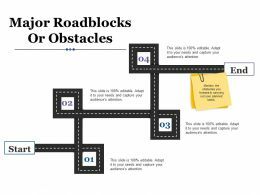 Presenting this set of slides with name - Major Roadblocks Or Obstacles Ppt Layouts Tips. This is a four stage process. The stages in this process are Year, Growth, Success, Time Planning, Business. Presenting this set of slides with name - Major Roadblocks Or Obstacles Ppt Summary Slides. This is a two stage process. The stages in this process are Obstacles, Business, Management, Planning, Portfolio. 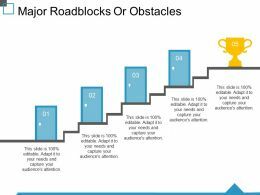 Presenting this set of slides with name - Major Roadblocks Or Obstacles Ppt Styles Deck. This is a four stage process. The stages in this process are Year, Growth, Success, Time Planning, Business. 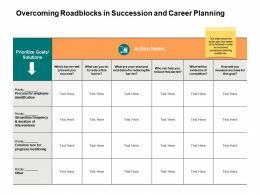 Presenting this set of slides with name - Overcoming Roadblocks In Succession And Career Planning. This is a four stage process. The stages in this process are Business, Management, Strategy, Analysis, Marketing. 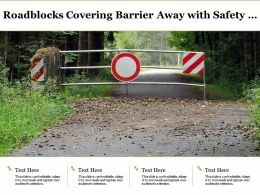 Presenting this set of slides with name - Roadblocks Showing Safety Barriers And Closed Warning Sign. This is a one stage process. The stages in this process are Roadblocks Icon, Barrier Icon, Barricade Icon. 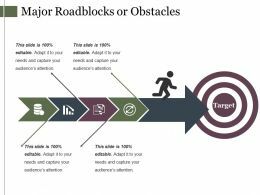 Presenting this set of slides with name - Major Roadblocks Or Obstacles Profit Based Sales Targets. This is a four stage process. The stages in this process are Business, Management, Planning, Timeline. 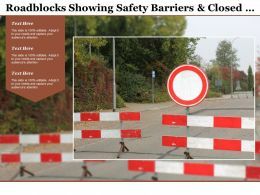 Presenting this set of slides with name - Roadblocks Covering Barrier In The Circle With Two Red Lights Icon. This is a one stage process. The stages in this process are Roadblocks Icon, Barrier Icon, Barricade Icon. 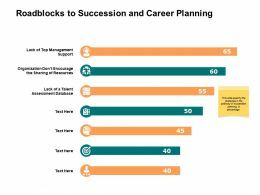 Presenting this set of slides with name - Roadblocks To Succession And Career Planning Ppt Powerpoint Presentation Ideas Slideshow. This is a two stage process. The stages in this process are Icons, Business, Management, Strategy, Analysis. …ppt examples. 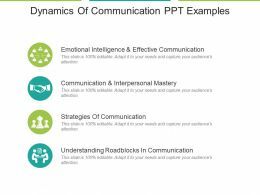 This is a dynamics of communication ppt examples. This is a four stage process. The stages in this process are emotional intelligence and effective communication, communication and interpersonal mastery, strategies of communication, understanding roadblocks in communication. …design. Replace the watermark with your company’s logo. Beneficial for the marketing professionals and the business planners. 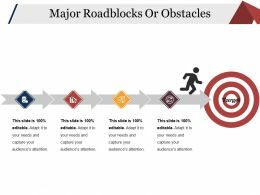 The stages in this process are comprehensive marketing strategy, marketing foundation, social media marketing, technical roadblocks, content strategy, website optimization.